Semi-desert, foothills, montane. Openings, shrublands, canyons, woodlands. Spring, summer. Canyons of the Ancients National Monument, May 13, 2004 and May 24, 2013. 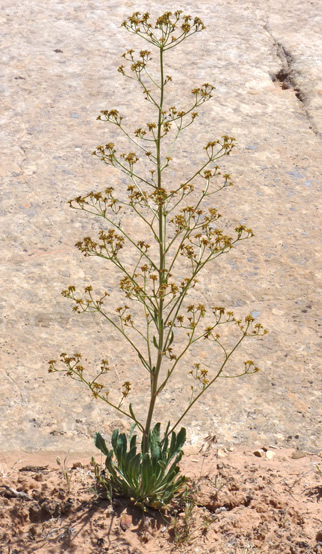 Winged Buckwheat is a common plant of low mountains and foothills, and it is especially common in the sand and rock areas of Canyon Country. It is often noticed, even in winter, as a mounded basal rosette of 2-4 inch long red/green leaves. The slender, gangly, spindly flower stem from 2 to 5 feet tall grows from the basal rosette in the spring and produces a very airy sweep of tiny yellow flowers followed by winged seeds. The basal rosette most often grows for one year and in the second year the plant flowers and dies. E. alatum has therefore most been termed a biennial. But Betty and I have noted that often the basal rosette persists for two, three, and more years and then flowers once and dies. Plants that grow and flower in this manner are called "monocarpic", i.e., a plant which grows for a number of years without flowering and then dies after it flowers. See Frasera speciosa. As of 2013, local floras no longer term the plant a biennial: Welsh's A Utah Flora calls the plant a perennial and Intermountain Flora and Colorado Flora call it a monocarpic. 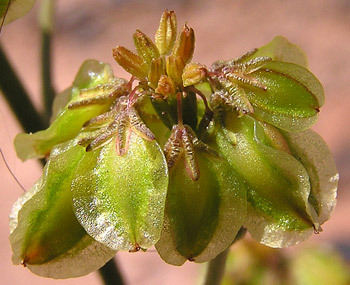 The dried, dark brown flower stalk persists for a year. 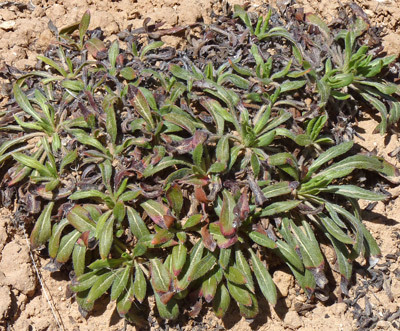 If there are other rosettes in the same clump, they may send up flower stalks in some future year. Eriogonum alatum fairly commonly has stunted and twisted stalks; most often these occur because deer like to eat the emerging bud and stem. Stems re-grow from just below the nibbled area. 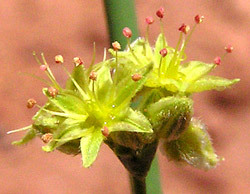 The Eriogonum genus was named by famed botanist, Andre Michaux in his 1803 Flora Boreali-Americana. 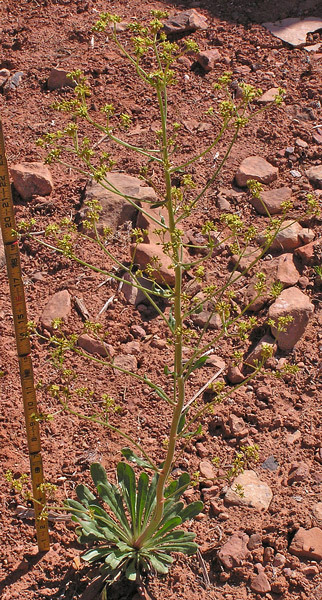 John Torrey named this species Eriogonum alatum in 1853 and H. Gross renamed it Pterogonum alatum. The Synthesis of the North American Flora, the Flora of North America, and A Utah Flora all accept the name Eriogonum alatum. Colorado Flora calls this plant Pterogonum alatum. "Pter" is Greek for "winged". 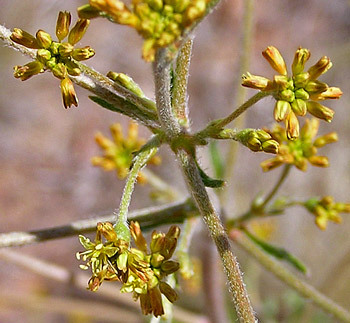 "Ogonum" refers to the "Eriogonum" genus. "Alatum" is Latin for "winged". Thus Pterogonum alatum translates then as, "the winged Eriogonum winged". "Erio" is Greek for "wool" and "gono" for "knee", referring to the "woolly leaves and swollen joints of the type species". Canyons of the Ancients National Monument, April 8, 2010. Winged Buckwheat's basal rosette of leaves persists through the winter, almost always with strong tints of maroon in the leaves. In early spring, chlorophyll masks the maroon and the plant adds more leaves. The rosette grows from one to many years and eventually a tall flower stalk emerges. The top rosette shown is two or three years old, but rosettes can grow many years and actually be mounded from the accumulation of many years of dried leaves -- as in the second photograph. The dried leaves and mounding of the base also results from several sets of leaves being produced in each season, i.e., under drought conditions the first set of spring leaves dies and a new set surmounts it. This may occur several times in a season. 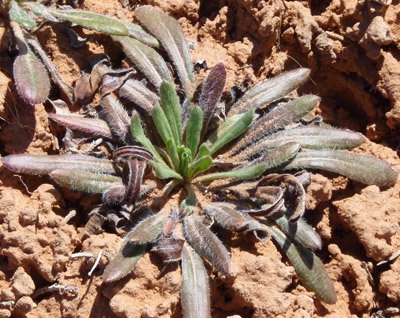 Compare this over-wintering rosette with that of Ipomopsis aggregata. 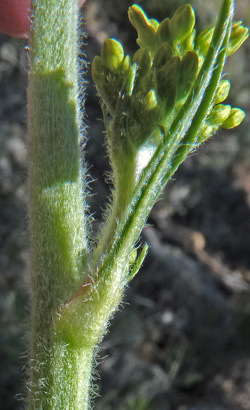 Early buds are ready to burst open; several have opened in the lower left. Behind the Rocks Wilderness Study Area, April 24, 2006 and western San Juan National Forest, May 31, 2013. Fully opened flowers and hairy buds are both just a few millimeters across. Some floras describe the stems as always glabrous but some are hairy. Winged seeds are the source of the plant's scientific and common names.